Peruse a hunting periodical, watch your favorite hunting show or scroll through social media feeds and it might be easy to come to the conclusion that hunting is all about the trophy — something like a sizable buck, bull or bruin on the other end of a well-earned shot. When it comes to either kind of hunting adventure — the type that nourishes the soul and produce a lifetime of big smiles and fond memories — it’s hard to beat a journey into the seemingly endless terrain that fills Canada’s biggest province. Welcome to the wild lands of Quebec. From an island filled with whitetails, to burly bull moose pushing their way through the lowlands, to forested ground that is crawling with black bears, there is much to like about a hunting excursion to Quebec. The province is easy to get to from the United States, the plentiful and varied habitat supports healthy populations of game and it’s quite simply one of the most enjoyable and affordable experiences that a hunter can find anywhere in North America. 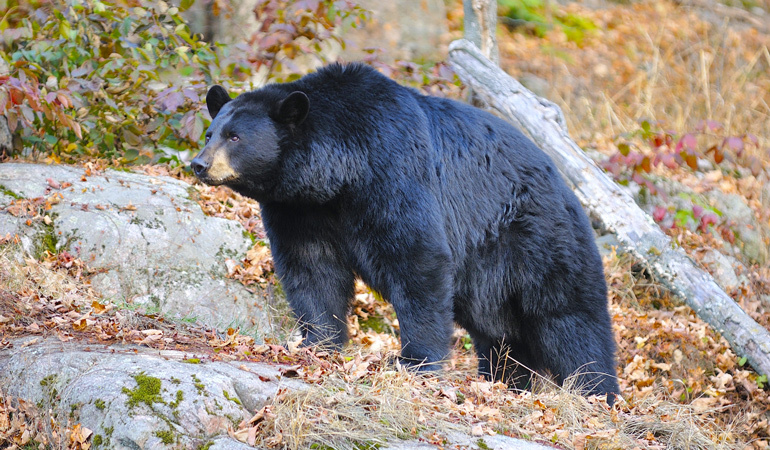 While there are many places across Canada and the U.S. to chase black bears each spring, Quebec certainly belongs on the must-visit list of any serious hunter looking for a good bruin and plenty of adventure. With long evening hunts the norm during the springtime, hunters can sleep in, enjoy a hearty breakfast, do a little mid-day fishing and then head afield for a hunt that promises the sudden heart-stopping jolt of a good springtime bear closing in. In fact, when all factors are considered, there might be few better options than Quebec for an affordable bear hunting adventure! “The Boreal Forest of Quebec is spectacular, and it only takes one look at that wild country to know it holds an ample supply of bears,” said outdoor writer Brian Strickland, a regular contributor to Outdoor Sportsman Group publications. A veteran of two recent spring bear hunts in the province, Strickland has first-hand experience — and a pretty good taxidermy bill, too — that offers proof to his belief that Quebec offers one of hunting’s best values. Thanks to the multitude of outfitters that offer bear hunts in the province, there’s no shortage of opportunity. And with the Quebec Outfitters Federation website, finding a good outfitter, lodge and hunting experience is a surprisingly simple process. If bears are a major part of Quebec’s big-game hunting experience, it’s safe to say that chasing the province’s big moose might also deserve a spot near the top of the list. There are certainly plenty of moose in the province, with some population estimates being north of 100,000. And since the population of Canada moose (Alaska-Yukon and Shiras moose are the two other subspecies) has generally been stable — or even increasing — in Quebec during the last couple of decades, the province offers a high quality and affordable hunt for the continent’s largest member of the deer family. Like any moose specimen across North America, bullwinkle bulls are huge in Quebec, enabling successful hunters to fill their freezers with some of the best wild meat available. And for those hoping for a taxidermy bill, the province can also produce some of the biggest moose found in the record books. In fact, the No. 3 Canada moose in the Boone and Crockett Club record book is from Quebec — a giant bull scoring 238 5/8 inches that was taken by Silas H. Witherbee in 1914. In more recent times, the Pope and Young Club’s current bowhunting world record Canada moose was taken in Quebec in 1988 when Charles Roy arrowed a 222 1/8-inch bull. 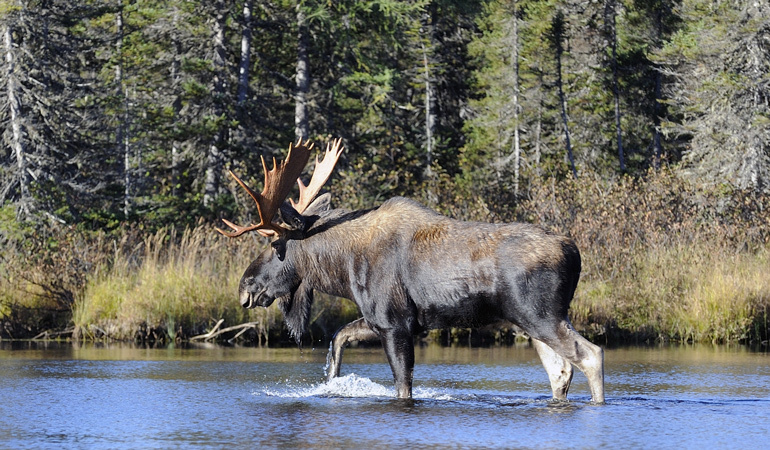 With moose hunting being a time-honored tradition in the province, there is no shortage of outfitters available for hunters to choose from. As with other forms of hunting, do your homework and carefully choose your outfitter since they can help you navigate everything from the province’s tag requirements and hunting legalities to the best times of the season to book your hunt to. Knowing what necessary hunting equipment to bring is also of the utmost importance. And if things go as planned, your outfitter can also help you out in the processing of meat, hide and antlers from a massive big-game animal that weighs north of 1,000 pounds! No discussion of hunting in Quebec would be complete without a look at the province’s unique herd of whitetails. For starters, in the southern regions near the lengthy border with the United States, deer can readily be found roaming the agricultural regions and dense forestland. For U.S. hunters traveling across the border from the upper Midwest and New England, the hunting experience will likely be somewhat familiar. Whitetails will ease through the big woods and scattered farm fields of Quebec where an eager hunter will often sit quietly in a treestand of some sort or even hit the ground for some spot-and-stalk action. For hunters used to chasing whitetails in the southern states or American west, a deer hunt in this vast and rugged province can often prove to be a welcome change of pace. And thanks to Quebec’s ample deer herd and a variety of outfitting options available, hunting whitetails in Quebec is both an exciting and affordable experience that will leave hunters yearning for a return trip the very next fall. For those with a thirst for adventure, Quebec offers one of North America’s true bucket list deer-hunting experiences on the whitetail-rich Anticosti Island. At some 138 miles in length and nearly 10 to 30 miles wide, this sparsely populated island — only about 200 permanent residents live in the island’s only town, Port-Menier — sits in the mouth of the St. Lawrence River between the Labrador Peninsula and the Gaspe Peninsula while offering visiting hunters a genuine wilderness experience. Originally hunted by the native Innu people, the island was once known as Notiskuan, or the “place where bears are hunted.” While that may have been so in centuries past, the island is now known as a place where whitetails are king thanks to the stocking of 220 deer in the late 1800s by Henri Menier, a French chocolatier who purchased Anticosti for the sum of $125,000. With no real apex predator to keep their numbers in check, whitetails have flourished on Anticosti over the decades, living in the dense inland region during the warmer months of the year while eventually migrating to the milder coastal microclimate in the wintertime where they feed along the beachfront on seaweed washed up by winter storms. Depending upon the year — and the severity of the winter — the deer population numbers can fluctuate annually from 100,000 all the way up to 140,000+. Why book a deer hunting trip to Anticosti Island when there are so many whitetails to hunt elsewhere? For starters, it’s a true wilderness deer-hunting experience on a remote island — something like chasing black-tailed deer on Alaska’s famed Kodiak Island. For those that venture to Anticosti Island, there’s also a good chance to take a velvet antlered whitetail when the season opens in early fall. In the middle of the season, deer hunters will experience the glories of the maritime autumn as winter approaches and these unpressured deer go about their daily routine. 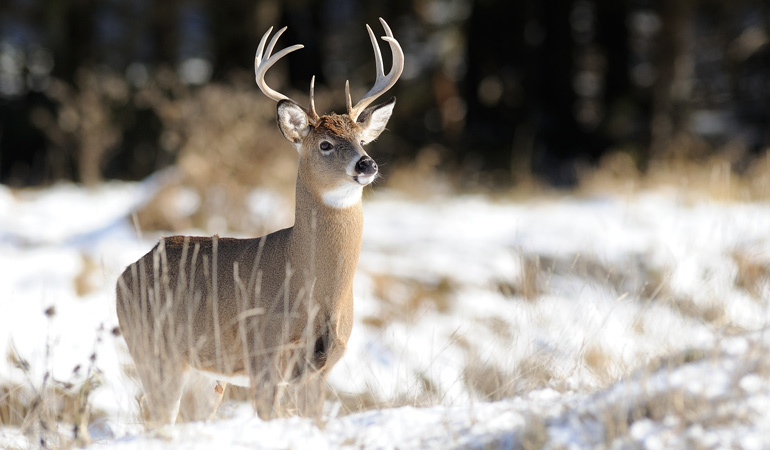 And by the season’s end near Christmas, one of hunting’s most unique experiences will happen as nor’easter type storms deposit snow in the interior of Anticosti, driving the island’s deer toward the milder beachfronts and the unique saltwater “food plots” of washed up vegetation. And don’t forget the fact that you’ll likely hunt for several days without seeing another hunter. Such a wealth of game and a lack of other hunters leaves Anticosti Island as one of the few places left in North America where a hunter can ditch the treestand, safely strike out on foot with a rifle or bow in hand and practice the time-honored tradition of quietly stalking deer on foot. In the final analysis, whatever game animal is being hunted, Quebec is a wonderful place to take a trip in search of adventure. From abundant wilderness and varied habitat to ample big-game numbers to great accommodations and food, there are plenty of affordable packages available to help a hunter take a memorable trip.